Scott Sumner has a couple of fascinating posts on recessions on his blog (see here and here). Scott argues strongly that recessions are a result of nominal shocks rather than real shocks. Scott uses an innovative measure to identify US recessions since 1948. Scott claims that the US economy can be said to be in recession if the unemployment rate increases by 0.6% or more over a 12 months period. That gives 11 recessions since 1948 in the US. 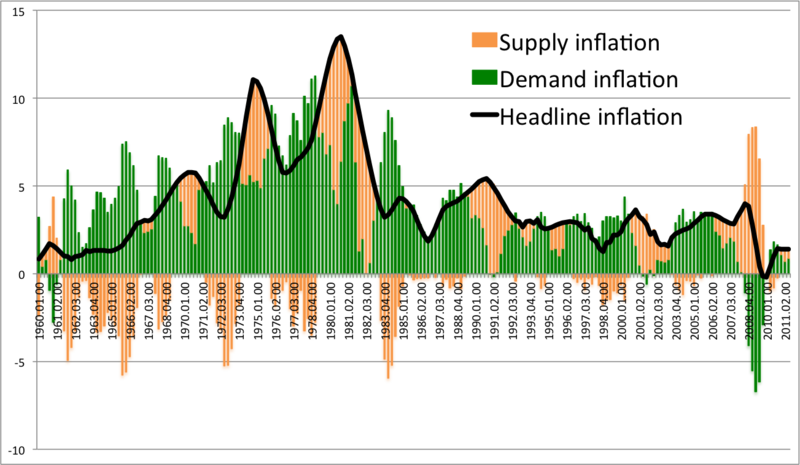 I have compared the timing of these recessions with my measure of “demand inflation” based on my Quasi-Real Price Index (QRPI). If Scott is right that nominal shocks are the key (the only?) 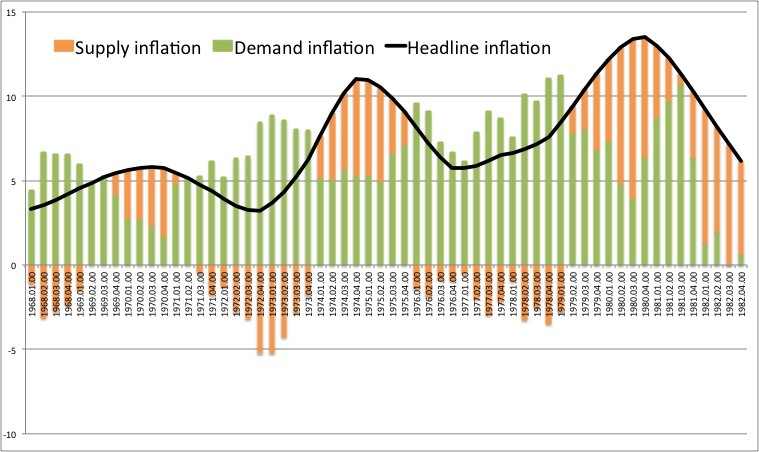 driver of recessions then there should be a high correlation between demand inflation and recessions. The correlation between the two measures is remarkably strong. Hence, if we define a negative nominal shock as a drop in demand inflation below 0% then we have had 7 negative nominal shocks since 1948 in the US. They all coincide with the Sumner-recessions – both in timing and length. 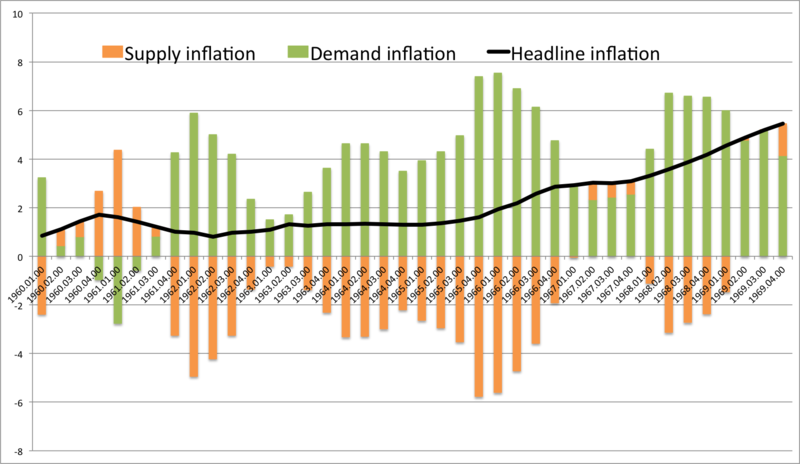 The only four of Scott’s recessions not “captured” by the QRPI development are the recessions in 1970s and the 1980s where demand inflation (and headline inflation) was very high. Furthermore, it should be noted that in two out of four “unexplained” recessions demand inflation nonetheless dropped significantly – also indicating a negative nominal shocks. This basically means that 9 out of 11 recessions can be explained as being a result of nominal shocks rather than real shocks. Hence, the evidence is very strong that if demand inflation drops below zero then the US economy will very likely enter into recession. So yes, Scott is certainly right – recessions are always and everywhere a monetary phenomenon! (at least in 80% of the time). So if the Fed want to avoid recessions then it should pursuit a target for 2% growth path for QRPI or a 5% growth path for NGDP!